Rated 5 out of 5 by Kikime from How did I miss this frozen snowflake? Purrrr! As soon as I saw inside both the standard game and the collectors edition, neither of which I would have looked into had it not been the daily deal, I knew I had to have one. The graphics are pretty and entertaining. The story is compelling and the game play is pleasantly logical, not difficult to follow. I enjoyed the creativity that went into the hidden object searches, especially look behind objects for matching symbols though I would have liked more things to look behind and maybe three of a kind to find after. I did try out the "match three game" just to seeit, and was happily surprized, a different kind of "match three" with a nice look. Graphics matter. I really like the watch game, as well, even though it is easy, I am a sucker for sparkly things. I loved the kitty, what a charmer. Besides, I am still happy he was willing to perform more than one activity for a single fish. I also can't think of words to say how (thankful?) honoured I am to have fertilized an in game flower seed with water that was swished in by one of those slimy mineral-skinned picture-fish. (once you know them from real life) I loved what I could see of the extras so much that, while I complain that I didn't get to weigh and measure the game dots, nice animals, catch those snowflakes, the collectors edition was a must have for me, even today, when for three dollars more, I could have gotten them both. What would I have done with two? Rated 5 out of 5 by bessiegirl from Enjoyed this game Despite the rather sudden ending, I really enjoyed this game. Fairly long for a SE as well as the gameplay was smooth and well thought out. Animations, color and graphics were very good. Voice overs were good except it sounded like the same girl did all the voice-overs which was a bit confusing at times. Was not really sure why the witch had such a thing for the town and the watchmaker...some of the story got lost I think in the gameplay. HOS were interesting and fun to do. A lot of puzzles which thanks to the custom settings I was able to set the skip to refresh very quickly so I could skip most of them. Not a puzzle player, and they seemed a bit odd besides. I did find the need to feed the cat a bit annoying...actually, the cat wasn't necessary to the story at all. Not sure why they put him in it. I got this on a BOGO, I think but would not have been disappointed if I had paid full price. Transporter map was excellent, one of the best I've used so I hardly ever had to use the hint. I never use walk-throughs so I'm not sure if it has one. Rated 5 out of 5 by biscuitsmama from THE HANDS OF TIME ARE BEING FROZEN IN THIS FUN FANTASY GAME Well detective, grab your purrball, Mr. Jenkins and head off to investigate another Ominous Object. This time you have been called by Heinrich the Clockmaker to a town called Glockenverk (really – LOL). When you arrive you meet Kate – after she steals your watch – and that is when you skate head on into your investigation. It looks like Heinrich has run out of sand in the big clock and very odd things are happening in town. People and animals are turning to ice and even some prehistoric beasts are arriving to complete the mystery. 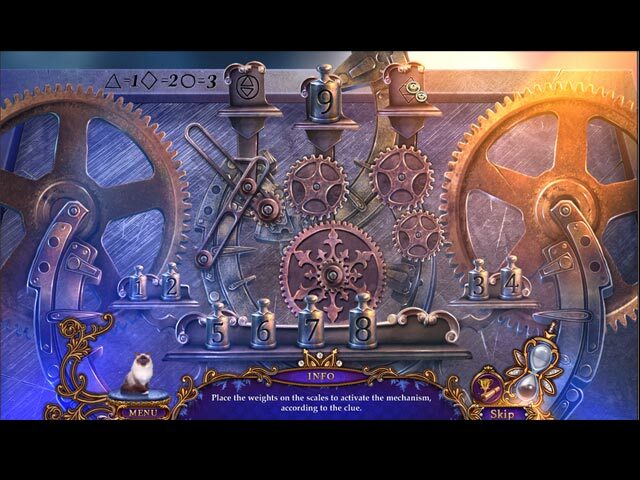 Can you help Kate set things right and get the clock ticking again in Glockenverk? I am not sure where to begin but firstly, the color palette turned me rather blue. I am so tired of the pink, purple, and blue tones used in these types of games but if I can get over the queasiness created by the color palette at least the graphics are sharp and crystal clear. The voiceovers are not bad but then again, they are not excellent. Your tools include an interactive map AND Mr. Jenkins. Not only do we have an animal helper but now we have to feed him fish to get him to provide his fetch and carry duties. Sorry devs, but this was almost too much for my early morning tummy to handle. I had high hopes that the days of animal helpers might be over but some devs just don’t seem to want to relinquish their purrballs easily. Not only do we have Mr. Jenkins to help us out, we also have a watch that must be charged before use by playing a mini-puzzle that I happen to like the mini-puzzle that must be played The HOPS are excellent and make up for the disastrous color palette. Even though we might visit the HOPS more than once (something that doesn’t bother me) they are different each time. If for some reason you find the HOPS difficult, you can play an alternate match-3 game. The puzzles are usual and not too difficult. That being said, I play almost every HOPA game released and my experience has been that the puzzles are generally more challenging as a game progresses so I am not too concerned when they appear easy in the beginning. Because I don’t care for having to feed Mr. Jenkins fish or the color palette, one would think I didn’t like the game but that is not true. I actually enjoyed the game and the gameplay so with a small deduction for the graphics, the game is a low 5-star game. Even with all the blue and purple, I am ready for something a bit more colorful than crumbling bricks and dreary graphics. 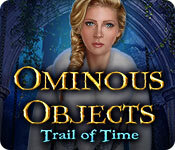 I am a big fan of fantasy games so Ominous Objects Trial of Time will be a great game to play on a dreary, cold and rainy day. Even though I like the game, please try the demo to see if Trial of Time is a game you will enjoy. 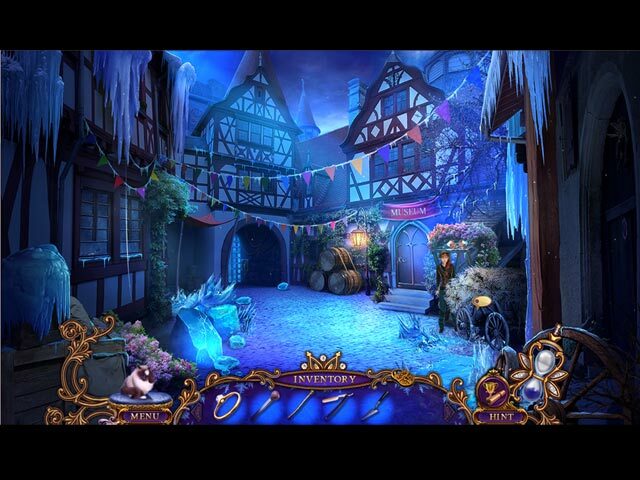 Rated 4 out of 5 by Aliana_4711 from Stop the witch. Pretty good developed, but too short My ranking is based on completion of SE and my personal requirements, which weren’t completely fulfilled. - Excellent graphics: they were pretty good - Good Animation: except when people are speaking, the animation is great. - Good Voices: good spoken, matching the characters - Music, is o.k, a little bit repetitive, but not playing constantly. - Fitting background noises. - Tools: An interactive map. And a helping paw: Mr. Jenkins. It has wonderful blue eyes and is always hungry. No fish – no work. - Story: was o.k. but the end was so-so. - HO’s: the game has mainly hidden pairs. Sometimes interactive. Alternatively an interesting match 3. - Mini games: nicely done, but not so difficult. - Many locations: if I counted right, there are 30 locations. - Challenge: The tasks were logical, but mostly easy. From my point of view, to obvious, especially with helping texts. Dislikes: - Length: I needed not even 3 hours – that’s far too short - Difficulty to be customized. You can choose: tutorial, map issues, contextual pointer, plus-item, sparkles at HO’s, glitter, hint / skip recharges. But you can’t exclude helping texts. If animation and graphics weren’t that good, I would give 3 stars only. Rated 4 out of 5 by Italia47 from Great game to play during a snowstorm! I have to say I really liked this game. I just completed the SE version and though it wasn't as long as I had hoped, it turned out to be a great game really. The usual storyline involving a witch, ice, black cyclone of smoke, the clock is ticking, and your mission is to save the town. Dilemma after dilemma, but the gameplay was very good. Puzzles were challenging, and some were not, the HOPS are up there with the best, graphics were lovely, clear and colorful but almost cartoonish at times. You have the option of playing the match game if you wish. Voiceovers were great. Map was very good. The music was wonderful. One fish per four times his help, Mr. Jenkins, a cat, would offer you his services until such time he was needed again and then you're prompted to find him yet another fish. Seemed fair to me. I didn't mind him at all actually. A cute distraction. You will need a watch that needs charging and that is done after you've completed a mini-game. Lots of tasks to keep you busy, and the flow in this game was very good. As with many SE's, the ending was abrupt. I'm not sorry that I bought this game. I played it during our very first snowstorm. I recommend this game; satisfaction guaranteed! I rate this SE version game 4-stars. Rated 4 out of 5 by pennmom36 from From The First Icy Breath To The Last Heinrich Glockenverk is one of the finest watchmakers in the country. After losing his beloved son, he worked day and night perfecting his finest time piece, a clock that would turn back the hands of time and return his son to his loving arms. However, Father Time has no intention of rewinding time for a mere mortal, and now the entire town is experiencing the wrath of Mother Nature as well, as she shows her fury by turning everything to ice. Even the animals themselves aren't spared as they begin morphing into vicious ice creatures that can only be stopped......by a watch????? Detective Leia has returned, as has the even more famous detective, Mr. Jenkins, and thankfully Leia has been equipped with a Watch that's able to reverse the frozen wicked beasts back to their original state. The Collector's Edition has some very unusual Achievements to earn throughout as well as Collectible Glass Snowflakes that can be used to upgrade each of the 11 Collectible Animals you come across. 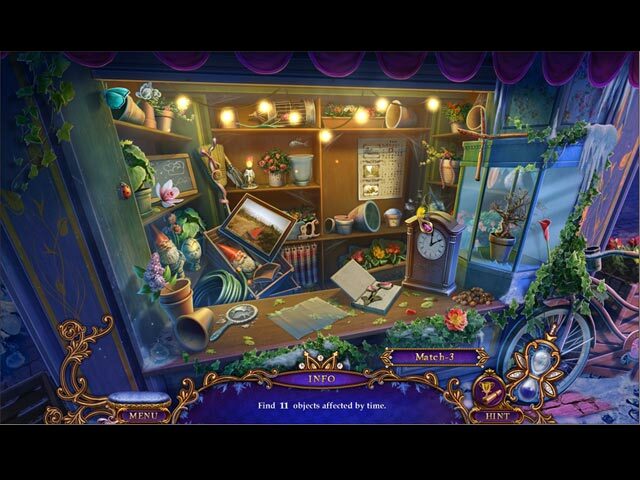 The Hidden Object Puzzles are very entertaining, but I was disappointed with the fact that some scenes are repeated, which becomes very boring in my opinion. There are interactive list finds, silhouetted shape finds, and even scenes where you uncover pairs of items. You can also opt for a Match 3 game if you're not into HOP's. The Mini Games are well done, but very easy. I've listed some brief descriptions below of some of the games you will encounter during the demo: 1) Cross the rope when the balls are in the center circle. 2) Place keys in the correct spots according to their silhouetted shapes. 3) Find the correct positions for each pin to open the lock, using up and down arrows. 4) Study the tokens, then make matches of items after the tokens flip over. 5) Place Roman Numerals on a clock correctly. 6) Using the clues given, place the weights on the correct scales. 7) Each time you use the Watch you must create a solid path for the animal to follow from beginning to end. The Collector's Edition has 4 levels of Game Dots, 11 Collectible and upgradable Animals, Collectible Glass Snowflakes, 4 Music Soundtracks, 8 Concept Art pictures, 8 Developer's Diary pages, 6 Wallpapers, 25 very unusual Achievements, a built in Strategy Guide and a Bonus Chapter. This game disappointed me because first of all the graphics were overwhelmingly blue, the storyline is just another watchmaker trying to bring his son back to life, and the gameplay was way to simplified. Rated 3 out of 5 by ninja226 from good for newbies Is it the best game out there? No Is it the worst game out there? No It's a middle of the road game, best for newbies, preferably bought on sale. Do not buy at full price. Pedestrian storyline and plot. No wow factor. There are 3 characters and voice overs, but no mouth moving when characters "speak" You have a helper in the form of a cat, but you must find fish hidden in scenes to feed Mr Jenkins before he performs tasks for you. HOGs are not challenging and you can switch to Match-3 instead of using hint if you have trouble finding objects. Many of the HOGs involve finding matching pairs of items that are hidden behind other objects. To unfreeze animals blocking your path to next level you have to find animal emblems that insert into your magic watch and point watch to animal to unfreeze. Puzzles are not too hard. Standard length gameplay. This is a good game to pass the time. Advanced and Expert level players will likely be bored by this game. Rated 3 out of 5 by zeldaqn from Average While it was cute. I found the puzzles to be quite simple. Liked the auto map. Played on no sparkles mode and still thought it pretty simple. Wasn't too long to get bored with it. Good length. Rated 3 out of 5 by gevans444 from Gigi Rules Fun game with some interesting and different puzzles. However, I am almost sorry I downloaded this game even if it was free. Not a challenging game at all. Rated 2 out of 5 by roaming from Didn't even finish the demo Everything about it was annoying, repetitive, and uninteresting.